in January the federal government opened the door for universities to deregulate vast portions of research in the social sciences, law, and the humanities. 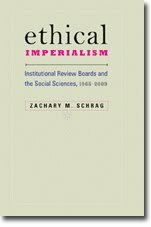 This long-sought and welcome reform of the regulations requiring administrative oversight of federally funded human-subject research on college campuses limits the scope of institutional review board, or IRB, management by exempting low-risk research with human subjects from the board’s review. [Richard A. Shweder and Richard E. Nisbett, “Long-Sought Research Deregulation Is Upon Us. Don’t Squander the Moment” Chronicle of Higher Education, March 12, 2017. 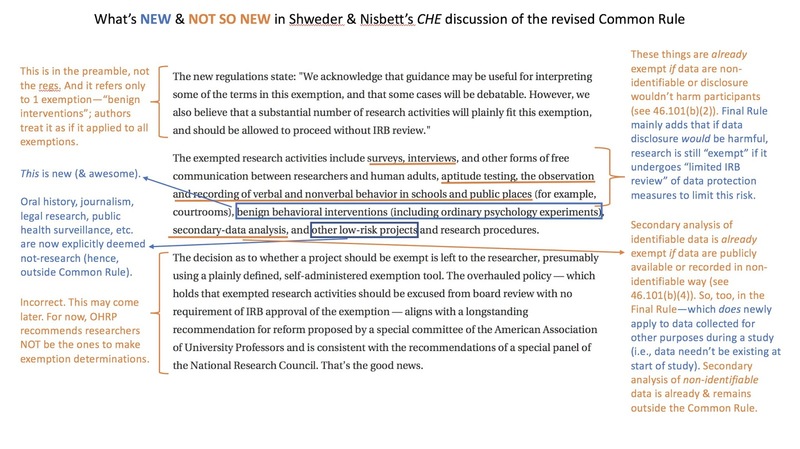 On March 16, Michelle N. Meyer tweeted a GIF showing that several of the provisions cheered by Shweder and Nisbett have been part of the regulations for decades. Indeed, since 2009, OHRP has grudgingly acknowledged that the Common Rule allows researchers to make exemption determinations. The problem has been persuading universities to take advantage of these longstanding provisions. In an April 19 essay, marking three months since the Federal Register publication of the proposed final rule, Shweder and Nisbett acknowledge the criticism. But they also emphasize that the proposed rule eliminates “the box” that encouraged institutions to submit all research, not just projects funded by the federal government, to federal oversight. “The Office for Human Research Protections has made it clear that it has no interest in overseeing research not funded by agencies bound by the Common Rule, the federal government regulations for human-subject research, or in applying the new regulations to such projects,” they write, and they encourage universities to take advantage of the new climate. The American Sociological Association announced the biggest change to human subjects regulation in a generation in a 240-word item on page 3 of its newsletter. 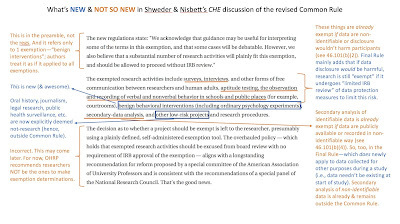 No analysis of how this will affect sociological research, or the failure of the final rule to incorporate the ASA’s recommendations. I haven’t found even that much notice by the American Anthropological Association. Also nothing that I can find from the Law and Society Association, which in 2007 and 2008 was so vocal on IRB issues. Historians are just happy to be free.